not only are these pancakes quick and easy, but they’re tons of fun to make. i have vivid memories of helping to cook these as a child, standing on a chair to lean over our wide wooden kitchen table wiped clean and scattered with flour. i loved watching the flour and water come together in a sticky dough, playing with the rolling pin to flatten huge circles, and shaping the dough into snakes and snails. the worst part was waiting for the pancakes to cook – i was always impatient for both sides to brown and could barely let each pancake cool before trying to stuff them in my mouth. but as soon as i could pick them up…then came the best part. clearly these addictions can start at a very young age. there are many variations of this recipe which use hot and/or cold water or this version by ming tsai which is essentially the same but lets the dough sit for half an hour. that doesn’t really work for me though, since i need my scallion pancakes fix fast. so i present to you the quickest and dirtiest version and i’ve included my favorite dipping sauce as well. 1. mix the flour and boiling water in a bowl, using a wooden spoon to form a ball. 2. pinch off a quarter of the dough and place onto a sturdy and lightly floured surface. use a rolling pin (or in my kitchen-item-bereft and active-social-drinker case, an empty wine bottle) to roll the dough into a flat circle. 3. pour some sesame oil onto the pancake, smear it around into a thin layer and sprinkle the chopped scallions on top. 4. roll the pancake up into a long snake and then coil the snake up into a spiralled snail. see the photos above if you’re confused. this is the best part for kids (and kid-like adults). 5. sprinkle a bit more flour on your rolling surface and then roll the snail spiral out into a pancake again. this double rolling technique means yummy scallion bits sandwiched between lots of thin layers of dough. it’s okay if the snake splits and scallions come spilling out, it’s part of the appeal. 6. heat some sesame oil in a pan and cook the pancake until browned on both sides. cut into triangles, serve with dipping sauce, and eat eat eat. 7. repeat with the rest of the dough. i can never stop myself from eating multiple pancakes, but if you have the self-control of a zen master, you can also roll them out and then freeze them. make sure to freeze them individually and then stack them or freeze between sheets of plastic wrap or waxed paper to keep them from sticking together. but a scallion pancake is really only as good as its dipping sauce..it’s partially a vehicle for a pungent and spicy dressing. here’s the best one…buy the ingredients in an asian market just once and then you’ll have them in the cupboard for all future pancaking adventures. 1. place the garlic clove on a cutting board. place the blade of a cleaver or large chef’s knife on top of the garlic and hold the handle steady with one hand. make a fist with the other. bring fist down and SMASH the garlic like the ninja you are. 2. combine everything else into a small bowl. if you don’t have any of the ingredients just leave them out or substitute with something else that you think might taste good. yum. try not to drink directly. 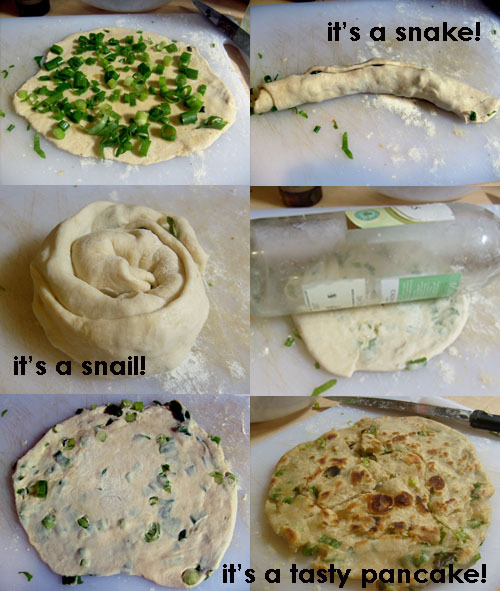 scallion pancakes are like the dough that held together our snake-snailing, and eventually pancake-rolled/fully-formed high school friendship. these and pesto. aha! your obsession smacks of my weakness for roti. Pulled apart in golden shreds. irene – homemade gnocchi…..GENIUS. seriously. i knew we had something in common. besides being related and all. rachel – i think the majority of our high school experience was spent stuffing ourselves full of carbs in my kitchen. YUM. handmade gnocchi is actually really easy! mei, we can make it when i’m back in londontown. miss youuu! ooh good call, i can see that being better for the dough. i’m actually making more.right.now.as.i.type. SO ADDICTIVE! !